I wanted to try making breadsticks as I thought it was about time I made something other than a loaf of bread. The instructions said make it with a dough hook, so I did, instead of kneading it myself. And somehow, instead of getting thin breadsticks like in the book, I ended up with something closer to mini baguettes. I’m not sure where I went wrong: maybe I let it rise too much the first time, or maybe I didn’t get enough of the air out after the first rise. If they weren’t so delicious I would have been disappointed! I will definitely use the flour in the same proportions of white, wholemeal and granary again, to make a loaf, and the pumpkin and poppy seeds are a great addition. I will probably knead it myself next time too: maybe I had under- or over-mixed it. And I will also try to make some breadsticks that are more like sticks and less like bread. 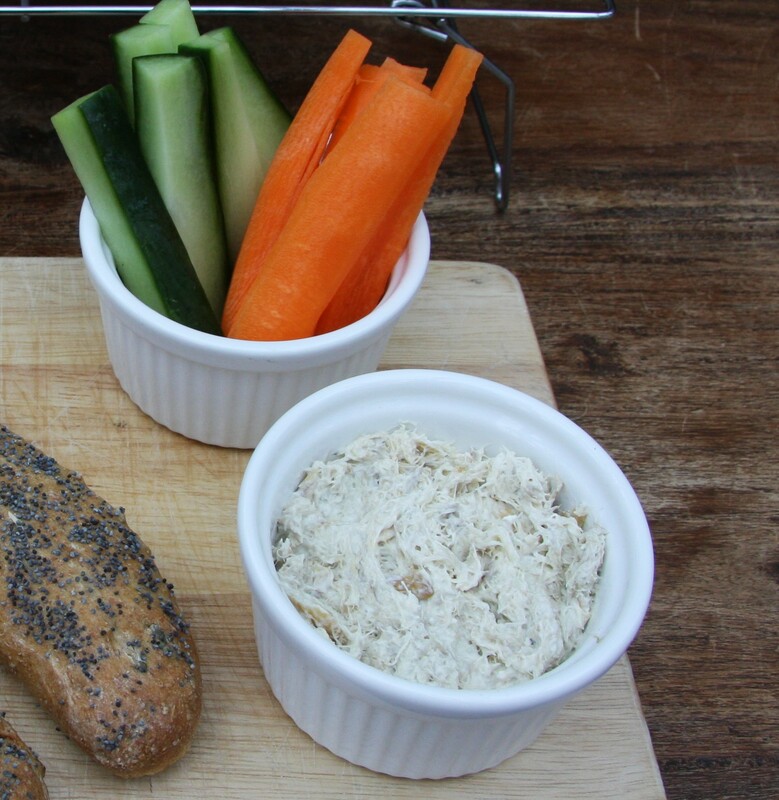 As it was, they were delicious with the smoked mackerel paté, which has to be one of the easiest things to make ever and is highly recommended as a quick lunch option, especially if you are inviting guests. Put the flours into the bowl of a mixer fitted with a dough hook, if you have one, and add the yeast and salt to different sides of the bowl. Add the butter and ¾ of the water and begin mixing on a slow speed. Slowly add the remaining water as the dough comes together. Then mix for 2 minutes on slow, then 5 minutes on medium. Add the pumpkin seeds and mix for a further 3 minutes. Leave the dough in a well oiled bowl, covered with cling film, for at least an hour, until at least doubled in size. 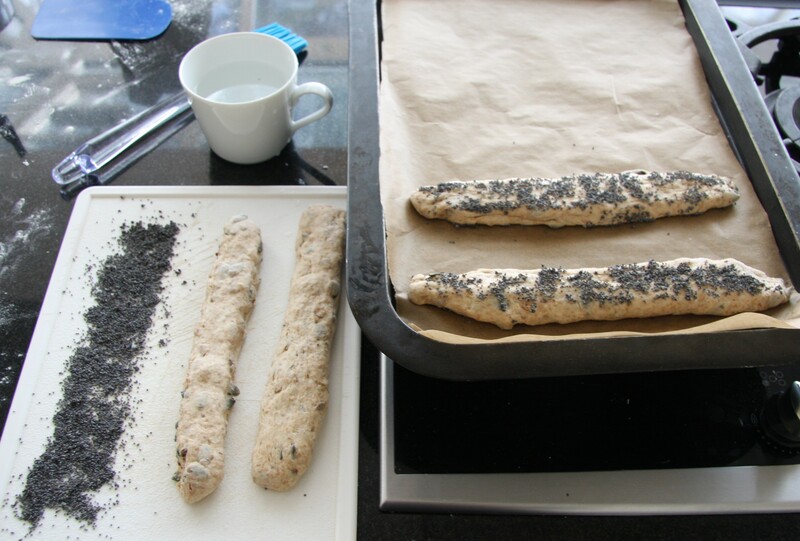 Line two baking trays with baking parchment and put the poppy seeds in a line on a board. Knock the air out of the dough on a lightly floured surface by repeatedly folding it in on itself. Divide the dough into ten pieces and make each into a slim stick. 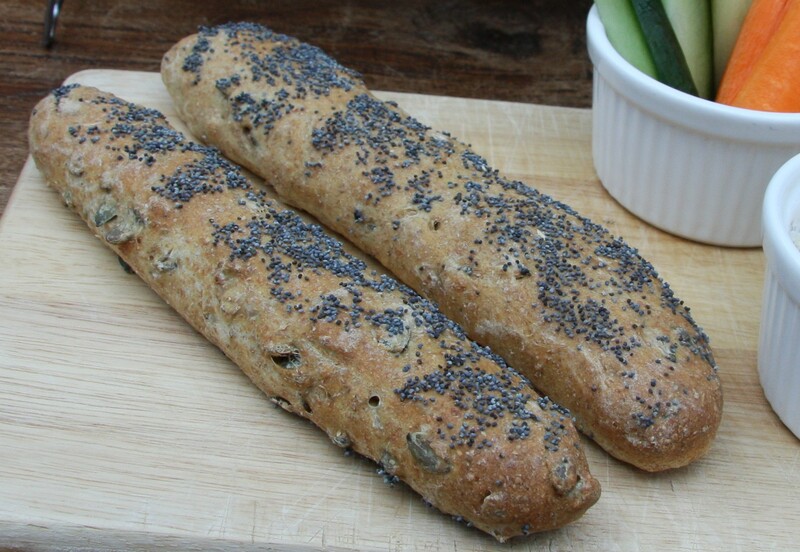 Brush with water and roll in the poppy seeds. Put the dough sticks on the baking trays and put each tray in a clean plastic bag. Leave to prove for about an hour, until at least doubled in size and springs back quickly if you prod it lightly with your finger. Bake for 15-20 minutes, until golden brown and crisp. Allow to cool on a wire rack. Weigh your smoked mackerel: I use about half the weight of the mackerel in cream cheese but add more or less as you prefer. Put the smoked mackerel fillets into a bowl and break up with a fork. Add the cream cheese and mix well. Add a squeeze of lemon juice and some freshly ground pepper and mix again until all properly combined. 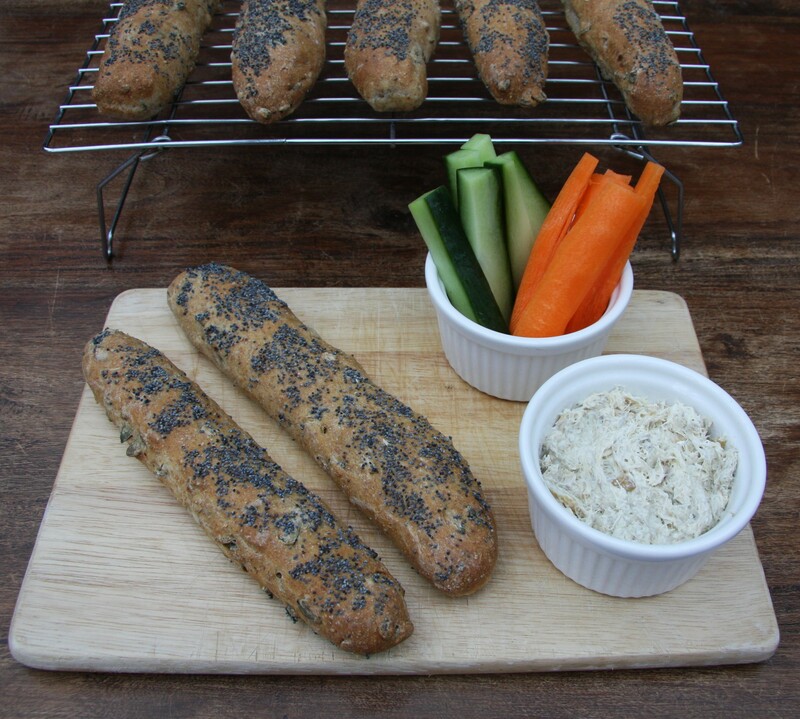 Serve in ramekin dishes with crunchy vegetables and fresh bread. This looks so good! I’ll have to try it very soon! My kind of lunch – Yum! I like the look of the bread “sticks”! 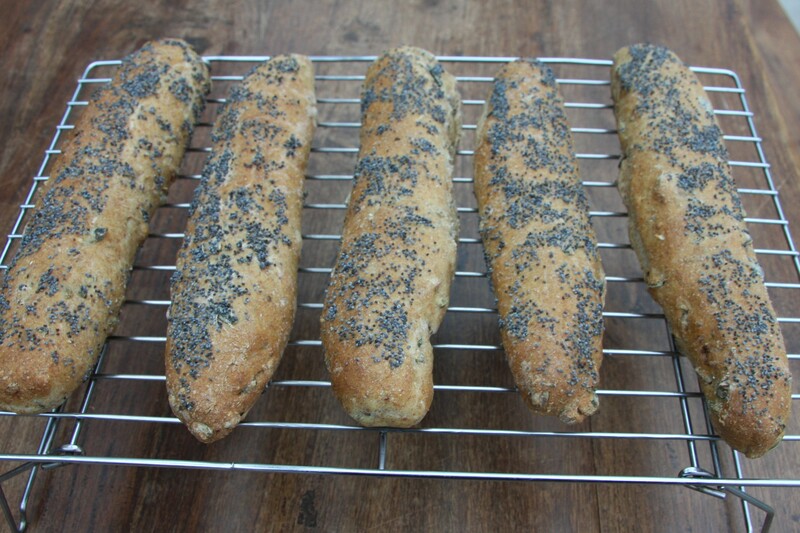 Just made the Paul Hollywood “sticks” and had exactly the same result. Very nice but definitely not a crispy breadstick. Has anyone else had a problem? Is it the recipe as it seems completely different from some others I’ve looked at? Hi Janet, thanks very much for your comment. I’m glad it wasn’t just me, sounds like it is the recipe. I keep meaning to have another go. At least it is delicious even if it is not a proper breadstick!